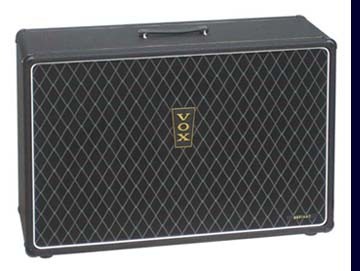 First produced in 1967, the Defiant amplifier remained in the Vox line until 1972. As part of a new for 1967 Vox solid state amp line that also included the 30 watt "Conqueror" and 100 watt "Supreme," the Defiant combined a twin channel, 50 watt amp head with an open backed speaker enclosure that featured two 12" Goodmans speakers and a Midax mid-frequency horn. The Beatles reportedly used Conqueror and Defiant amplifiers while recording their Sgt Peppers and Magical Mystery Tour albums. North Coast Music offers an accurate, factory licensed reproduction of the Defiant speaker enclosure. 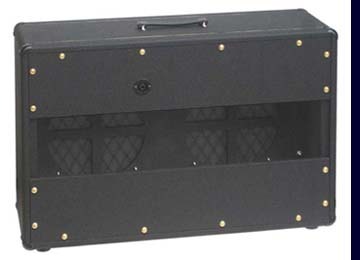 The North Coast Music reissue Defiant enclosure is constructed from 3/4" baltic birch plywood and features half lap joinery, eight 2-pin corners, black basket weave vinyl, black Vox diamond grill cloth, a vertical Vox logo, a single 1/4" speaker jack with a 20" twin lead wire and original style Rean feet. All speaker mounting hardware is also included. North Coast Music also offers, at option, chrome swivel trolleys for the Defiant enclosure. NCM-330D - Defiant Enclosure (no speakers) - Designed to accommodate 2 x 12" speakers and one Goodmans Midax horn (speakers and horn not included). Open backed, black grill only. ~32" wide, ~21" tall, ~11.75" deep. All North Coast Music reproduction cabinets are hand made by order, no returns or exchanges are possible. Please allow several weeks for shipment from time of order. US sales only.